2014 Internet Security Conference of China opened-WoSign SSL Certificates! Co-sponsored by Internet Society of China (ISC), National Computer Network Emergency Response Technical Team/Coordination Center of China (CNCERT/CC), National Computer Virus Emergency Response Center and National Information Technology Security Evaluation Center, co-hosted by 360 Internet Security Center, network and information security work committee of Internet Society of China, the 2014 Internet Security Conference of China opened today. As a participating company, WoSign will witness a successful annual event of internet security with you. White hat hackers come from China and America will deliver on-site lectures to show their consummate skills. Father of computer virus will return. The cracking process of Tesla will be exposed on-site. Many more cool techniques await your presence. What's more, there will be over 100 internet security experts giving speeches in this ISC conference and the number of participants will exceed 20,000. In the afternoon of 24, CTO of WoSign, Mr. Wang Gaohua will deliver a speech titled PKI technology makes secure cloud in the sub-forum of cloud infrastructure and storage security, discussing with industry insiders about how to build secure and trusted cloud. 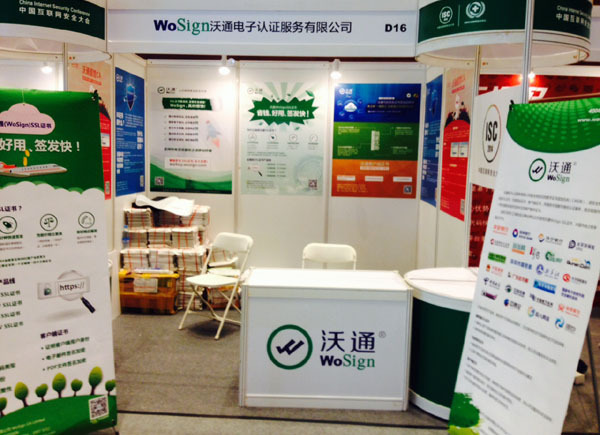 WoSign sincerely invite you to visit our booth (D16) during 24 to 25. We've prepared gifts and are looking forward to your visit.